Little is known of the life of Oku Bunmei, except that he was one of the most talented pupils of the celebrated painter Maruyama Ōkyo. He displayed extraordinary control over the ink on his brush, seen here in the curling tendrils of the gourd plant. A master at transferring his careful observation of nature onto paper, he uses the minutest touch of bright yellow for the centre of the flower to enhance his variations in ink tone on the leaves, stems, and fruit. 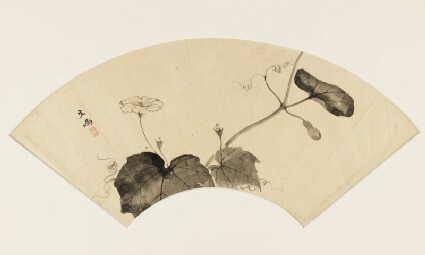 Bunmei has painted a flowering gourd plant in ink, with just a touch of yellow in the centre of the open blossom. The thin stems of the flowers grow out of a base of broad leaves, and a small gourd is seen forming on the right. Spirals of delicate calligraphic lines form the plant’s tendrils. Bunmei is obviously a master of controlling the ink through painting techniques, however here he combines this with an obviously careful study of nature. Although one of Maruyama Ōkyo’s ten best pupils, details of Bunmei’s life are scarce and extant paintings by him are extremely few. He is especially well known as the writer of the biography of Maruyama Ōkyo, the Sensai Maruyama sensei den. In 1790, Bunmei was part of Ōkyo’s workshop that produced wall paintings for the Imperial Palace, and he also executed paintings for Daijōji temple of which a painting of wisteria and birds, an Important Cultural Property, is extant [published in Minamoto and Sasaki, 50, 191]. That composition displays the same controlled handling of the brush without making the composition look contrived as in the Ashmolean’s fan painting. Bunmei is able to show the real complexity of organic forms as they grow and twist, while managing to produce neat and pleasing pictorial compositions.